We’ve hit 300 Facebook Fans!! As of this morning, we now have 300 “fans” on Facebook!! If you’re one of them, thank you! If you’re not, please come on over, check us out and become a fan as well! The link can be found here: The Belgravia Bed & Breakfast on Facebook or over there on the sidebar! It was so worth the trip! We got to meet them all and they were so kind! They were interested in the team and talked to them about curling and the fact that they have their first tournament (together) over our March Break. 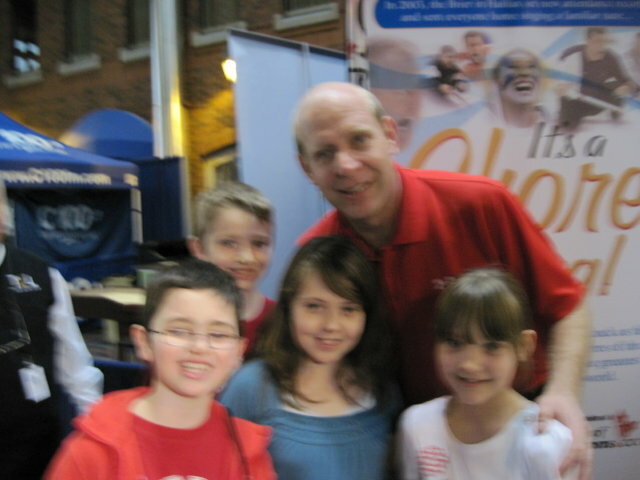 They were so gracious and exemplified all the qualities you would expect in curlers. 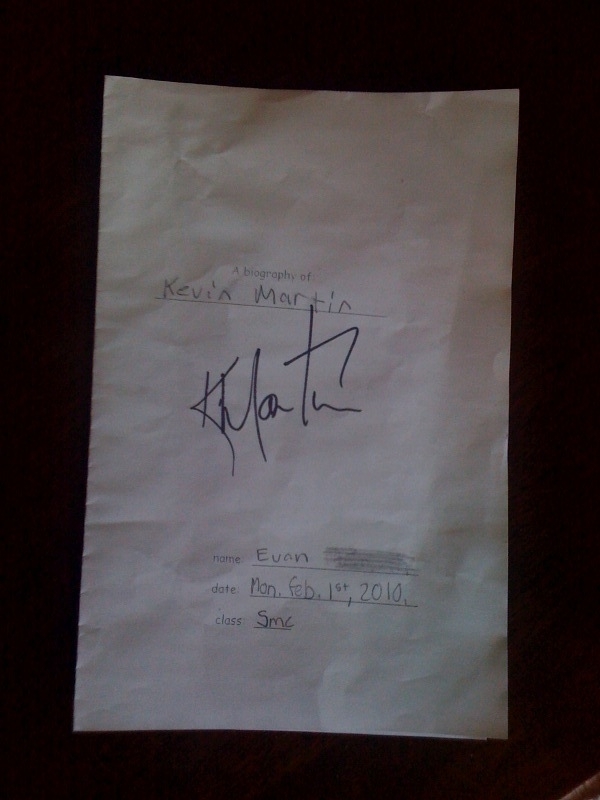 Our son Evan took a biography he’d written about Kevin Martin and got him to sign that! 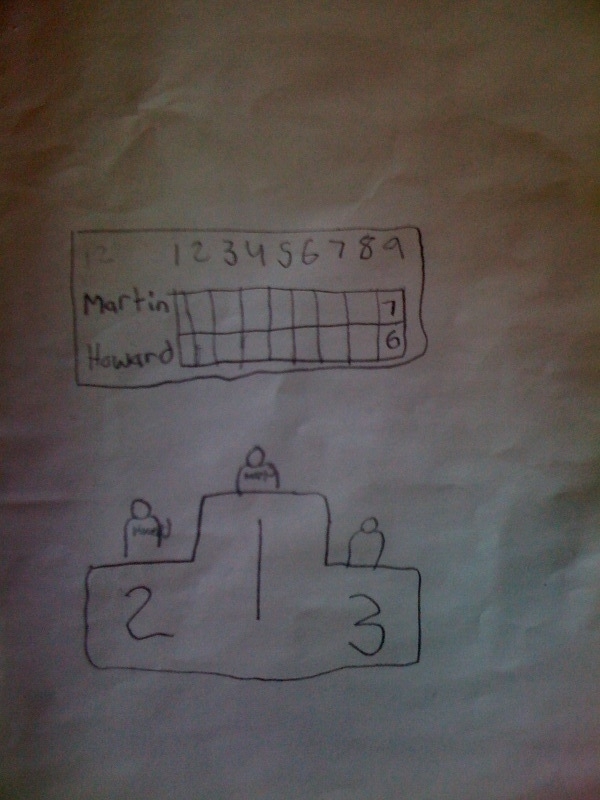 Kevin read it carefully and smiled at the photo Evan had drawn of him on the podium next to Team Howard at the Olympic Trials. 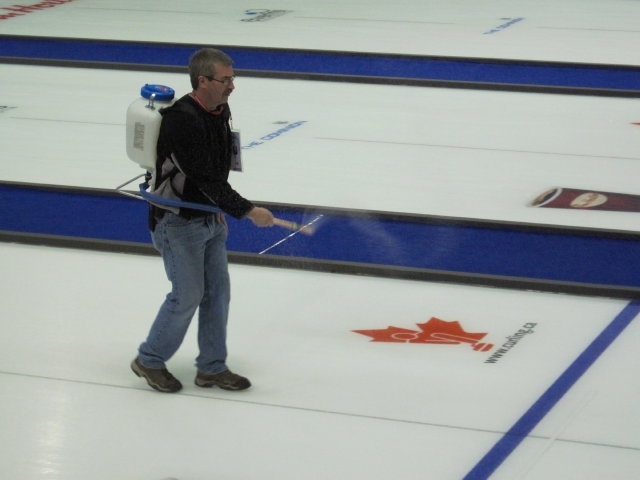 I’m not sure that Team Howard, who are also at the Brier, would have found it so cute! 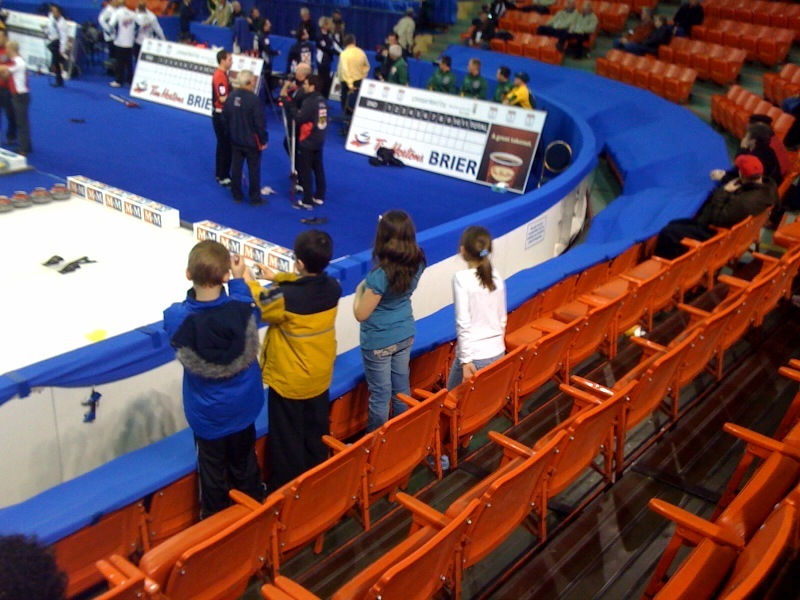 The kids got noticed by the television crews and were interviewed both for the news and by the Canadian Curling Association. How exciting! 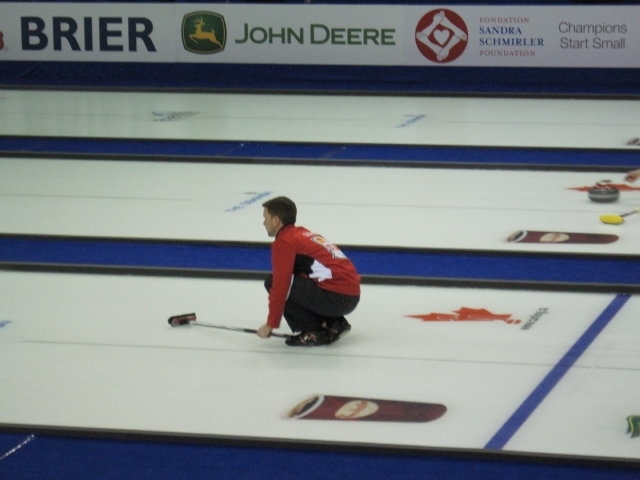 Our nephew, Christopher, is a curler and curled with Team Fitzner-LeBlanc (Team Nova Scotia) until he moved to Calgary last year. They started curling together when they were just seven years old, younger than our boys are! 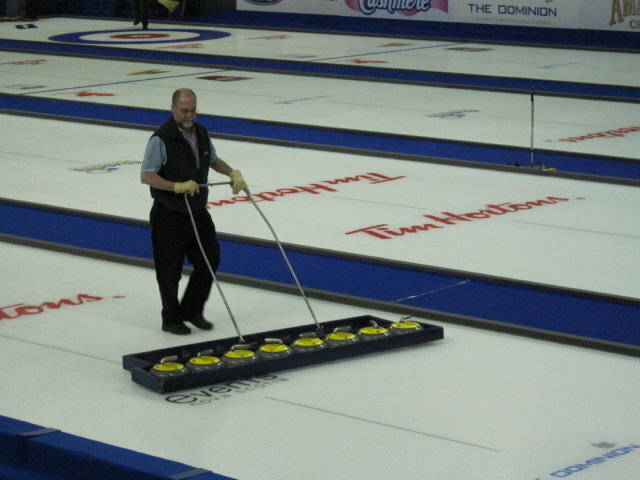 I think it’s hard for Chris not to be here with them at The Brier! We ran into his mother Kim, and sat with her watching the “Hot Shots” skills competition. 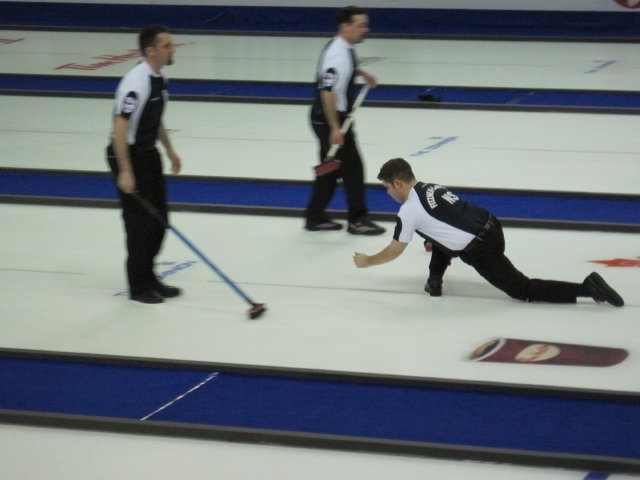 Unfortunately, we couldn’t stay for the entire thing, because we had to get back to Truro for Curling Practice but we were pleased to learn that Ian, skip of Team Nova Scotia, won third place overall! Yay Ian!! 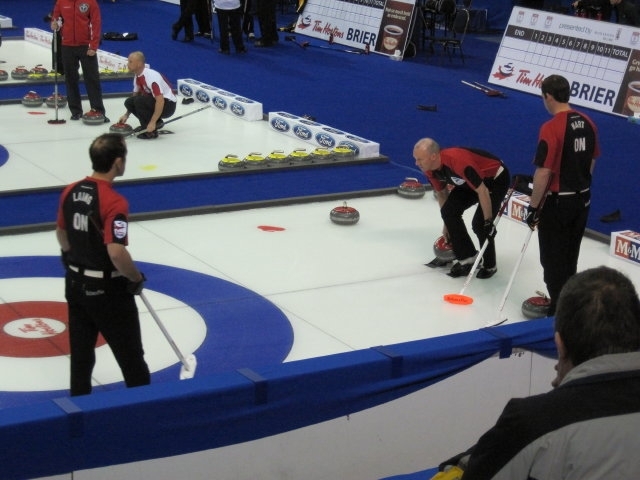 While we were watching the first group, we noticed that Team Gushue (Newfoundland) were sitting behind us. 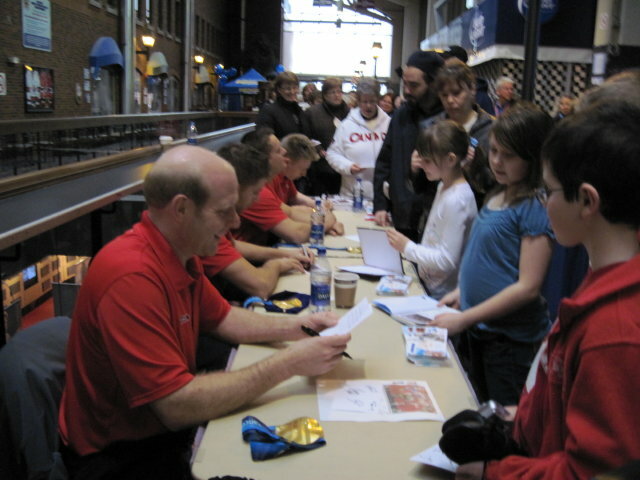 For those non-curlers out there, they are the team who won the gold medal at the 2006 Olympics! 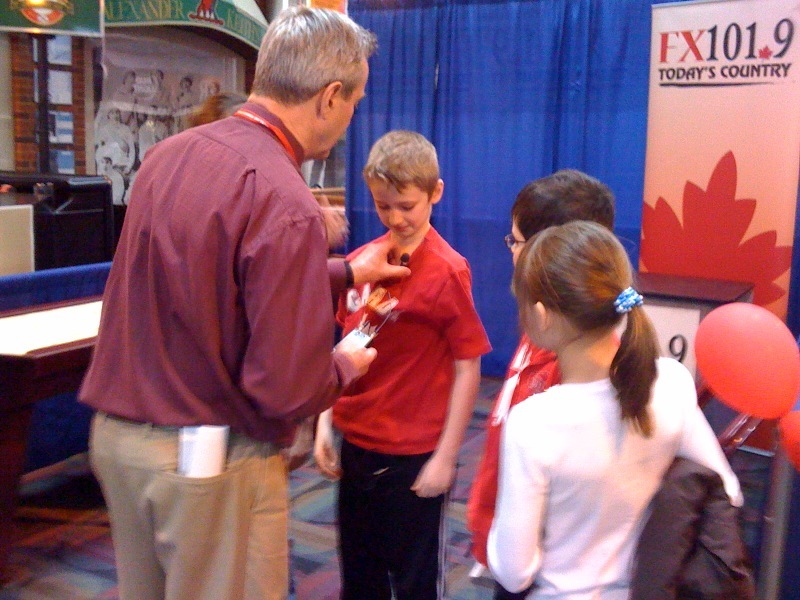 I took the kids over to get their autograph and to wish them well. While the team was talking with them, one asked who they were rooting for. Madison declared “PEI!” while our boys stated, “Nova Scotia”. 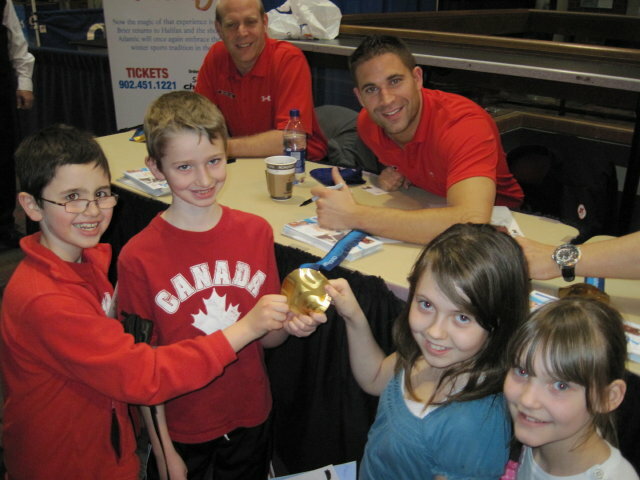 Team Gushue all laughed and said, “Well no autographs for you then!” The kids were sheepish when they realized what they had done and wished them well! We all had a good laugh! Johnny Mo insisted that they hold the gold medal for the photo - it wasn't hard to convince them! Kevin Martin leaned in to Evan and said, "Your mom's hands are shaking!" I think Madison's mom got a better one! 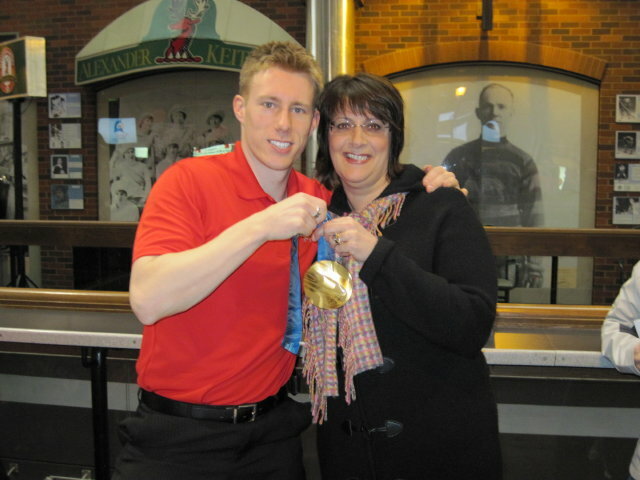 Our sister-in-law Kim with Marc Kennedy & his gold medal! Our team, taking photos of some of their heroes before going home to their own practice! And while we’re at it, we Canadians want to thank YOU for staying with us and sharing our stories & people with your viewers! After tonight’s broadcast and after looting our hotel mini-bars, we’re going to try to brave theblizzard and fly east to home and hearth, and to do laundry well into next week. Before we leave this thoroughly polite country, the polite thing to do is leave behind a thank-you note. For being such good hosts. For your (mostly) beautiful weather. For scheduling no more than 60 percent of your float plane departures at the exact moment when I was trying to say something on television. For not seeming to mind the occasional (or constant) good-natured mimicry of your accents. For your unique TV commercials — for companies like Tim Hortons — which made us laugh and cry. For securing this massive event without choking security, and without publicly displaying a single automatic weapon. For having the best garment design and logo-wear of the games — you’ve made wearing your name a cool thing to do. For the sportsmanship we saw most of your athletes display. For not honking your horns. I didn’t hear one car horn in 15 days — which also means none of my fellow New Yorkers rented cars while visiting. For making us aware of how many of you have been watching NBC all these years. For having the good taste to have an anchorman named Brian Williams on your CTV network, who turns out to be such a nice guy. For the body scans at the airport which make pat-downs and cavity searches unnecessary. For designing those really cool LED Olympic rings in the harbor, which turned to gold when your athletes won one. For always saying nice things about the United States…when you know we’re listening. For sharing Joannie Rochette with us. For reminding some of us we used to be a more civil society. Mostly, for welcoming the world with such ease and making lasting friends with all of us. We stayed up late last night to watch the closing ceremonies of the Vancouver 2010 Winter Olympic Games. I can’t tell you how hard we laughed as we watched. 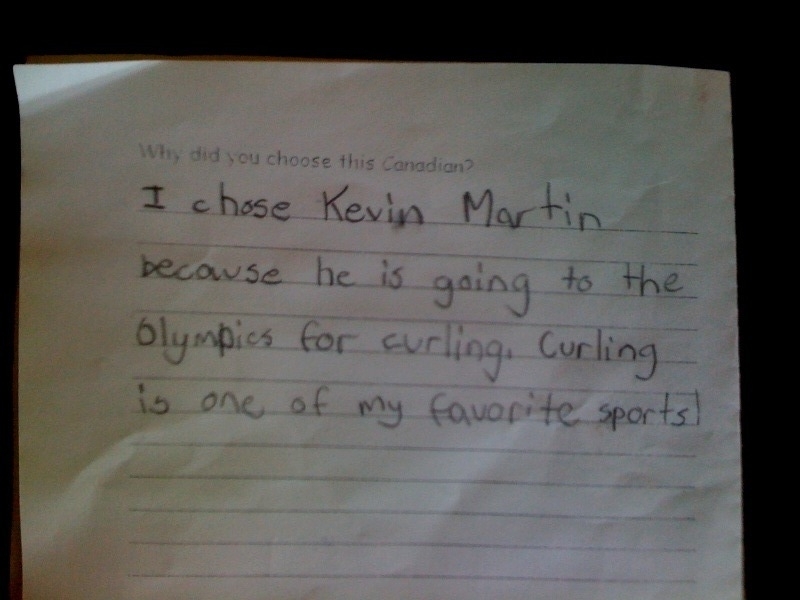 I don’t think anyone can argue that Canadians are the best at poking fun of ourselves! It’s felt really great to be Canadian these past couple weeks as we watched all the amazing, human stories come out of the games. I’m attaching a short video that is now at least ten years old; it was a popular beer commercial at the time and stars a former Truro boy, high-school friend, Jeff Douglas.